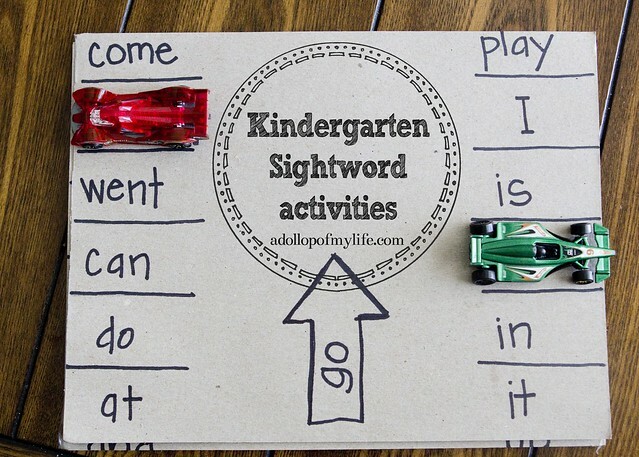 10 Kinetic Kindergarten Sight Word Recognition Activities. In case you're wondering, the first two months of Kindergarten have gone quite well. I think I've had to adjust more than Brayden, who has fallen into the routine and changes better than I could have even imagined. He absolutely LOVES school, LOVES his teacher (we do too!) and LOVES learning. One thing that I was not prepared for was the amount of creative energy I would need to exert in the afternoon, which has historically been the lowest point of the day for me. I have to sift through the paperwork, the folder and the lunch box, and then try to organize a 15 minute activity for Brayden to do. Thankfully our Kindergarten teacher gives a lot of ideas and guidance on how to direct our time. But in talking with my friends, I have found that this is not the norm. This leaves parents to have to sift through all of the online ideas of sight words and letter recognition on their own, or do nothing at all. So I thought I would share with you a few of the ideas that we've used to help Brayden master his sight words. Brayden tends to be a kinetic learner, meaning that if we incorporate some type of movement with his learning, he tends to learn and retain the information better. Here are a few ways that we've incorporated movement with learning. 1. Fill a ziplock bag with finger paint (roughly 2 tablespoons). Using tape, secure the bag flat against a table or countertop surface. All your child to draw the letter or sight word with their finger. Brayden LOVED this, but I did have to carefully watch him, otherwise I'd find him trying to poke holes in the ziplock bag. 2. Fill a casserole dish with salt or flour (salt's less messy IMO) Allow your child to draw their letters or sight words in the medium of choice. 3. Sight word/Letter garage. This was probably Brayden's most favorite way to learn. I used several pieces of letter sized cardboard and taped them together in a trifold. Then I wrote down all of Brayden's level 1 sight words, and would call out a sight word and have him "park" his Hot Wheels in the garage space. The great part about this way to learn is that it can also be used as a simple list. Sometimes Brayden just wanted to use a pencil as a pointer, and point out the words. 4. Play sight word HORSE (the basketball game). Our teacher actually gave us this idea. She recommended having the child bounce the ball to each letter in the sight word, then shoot once it is spelled, yelling the sight word out as the shot is made. We only tried this once with Brayden. Surprisingly, he wasn't as interested and asked if we could do the hotwheels garage instead. 5. There are A LOT of printables and worksheets out there on the internet that you can take advantage of. Brayden is hit or miss with worksheets. Somedays he LOVES them, and some days it's like pulling teeth. My favorite sight word worksheets were actually created (and free to download!) by Confessions of a Homeschooler. You can find the worksheets HERE. The reason I like these worksheets so much is that (a) the quality with which they are made is great (b) they involve a variety of learning mediums, including sight, writing, cutting and pasting. I feel like this covers all your bases in the learning department so that your child learns thru various methods. 6. This isn't exactly kenetic, but we have had good success with it so I thought I'd share. Our teacher actually suggested this as a way to practice letters. Create small flashcards with your letters/sight words on the cards, and then lay them flat on the ground, facing up. On top of the cards, lay a reward (a small candy, like an M&M, or a penny). For each sight word or letter that your child gets right, they get to keep the prize. Brayden LOVED this game, as candy is a BIG treat in our home. 7. Draw the sightwords on the sidewalk with chalk, and call out a word, having the child run and JUMP on the sight word. 8. Use a dry erase marker to write sightwords on the back of a cookie sheet. Then give your child magnetic letters (I found a set of magnetic alphabet letters for $1 at Walmart in the toy section) and have them "fill out" the words with the magnets. 9. Our teacher gave us this idea: Write the sight word on an index card with white crayon (I found that this turned out better if I wrote the word instead of Brayden), and then have the child paint on the index card, revealing the sight word. This was one of Brayden's favorites, and I'm convinced it was this along with the hot wheels garage that helped the sight words "click" with him. 10. If we were having trouble with a word, Brayden and I would make up a song to spell & say the word, and would sometimes clap. This engaged him with both movement and sound (I think he is also an auditory learner, so a lot of times I would combine the two learning styles). One thing to note: a lot of times I would chose the most boring way to work on the words. Then on the ones that he struggled with, I'd use one of the more fun ways (paint, hot wheels garage, etc) to work on the harder ones. This kept him engaged for the entire time we were working (we'd work no longer than 15 minutes). Also, I split up the words into groups of about 6 at a time, and then when he'd conquered that group, I'd move on to another group, als reviewing the first group he memorized. When we first started, I was trying to do the entire list at once, which was frustrating for all involved. Breaking it up helped Brayden feel like he was accomplishing something, and didn't discourage him with a large amount of failure during one sitting. The pic on the left is of Brayden on Friday after he recited his sight words. His teacher has a "race to the moon" for all of the different levels of learning (capital letters, lowercase letters, letter sounds & sight words).